I spent the greater part of yesterday watching movies after battling Netflix proxy and VPN blocking. Netflix has a lot more movies for its US subscribers than it has for subscribers from other countries. If you draw a bar chart of numbers of movies available to watch against each country name, USA, UK, Canada, France, Germany and other developed countries get a lot more content and will have a higher bar than Nigeria. I think Nigeria and other African countries have the lowest number of movies available to watch on Netflix. Reason? Netflix says it's Hollywood's geo-licencing to blame. So when I spent hours trying to set my region to USA so I can enjoy the full Netflix movies catalog and eventually succeeded I went on a movie watching binge to celebrate that success. 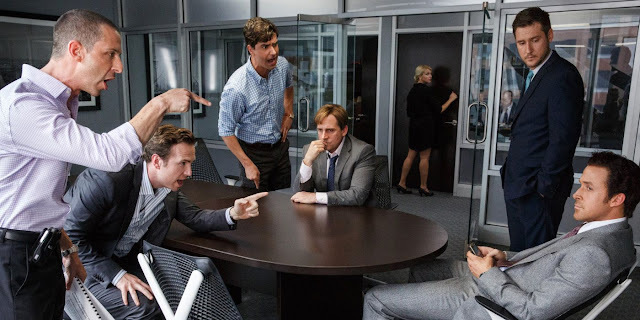 I watched about five movies, including The Big Short which triggered this blog post. I had heard GTBank CEO, Segun Agbaje, talk about it in a talk he gave at This Present House church a few months ago. Unfortunately, I couldn't enjoy the movie as much as other people would. I was familiar with everything it was about. I have read too many books and articles about the 2007/2008 financial crises and knew too much about it already. But there was something strong and well worth the time that I took away from it -- someday, Nigeria's financial markets will be that robust and data driven and I want to be right at the center of it all. Just the same way our banking sector rose in the early 1990s and are now global (at least, African) players, I see the same happening in the financial markets sector. We are going to have our own brand of Bloomberg, Moody (Agusto is already starting this), Standard and Poor's, Online Brokers and Financial Research houses. And, again, I want to be in the center of it all. I don't know how, I just know that I will be extremely sad if I miss this obvious opportunity. I am not planning to be like the folks in the movie, profiting from trades or betting against a broken system. I want to be there as a platform builder. The middleman in the center of it all. Selling vital services to all parties -- data services. Financial data.